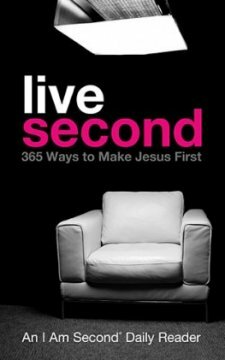 “Live Second” is a devotional-style book to accompany the popular “I Am Second” movement. The idea is to have the reader reflect on what the Bible has to say about us and our relationship with God. Are we putting Him first? How can we practice putting God first? The book consists of 365 short readings. It is broken up into 12 sessions, each with 4 or 5 weeks of lessons. Each session begins with a quick overview. Day one of each week begins with the reader watching a video testimony of a person who has chosen to live second. There are a few questions that follow. Days 2-7 for the rest of the week begin with a key verse, then you are asked to read from your Bible a section of scripture from which the daily reading’s lesson will come. The key questions for each day follow as you decide how to “live it” and “tell it.” There is also a section of prayer. You will often see a short statement to get you on the right path with what the focus of your prayer should be. Overall this is a good book. In all honesty it is more suited for group setting than individual reading, though a person reading on their own will still be able to take a great deal away from it with honest, personal reflection. I say that it is more suited for a group because it doesn’t offer much in the way of suggestion for the “live it” and “tell it” portion. It simply asks “How will you live more second today?” and “How will you share what you have learned?”. A group discussion would probably be beneficial here to exchange ideas. Day 1 of each week is also geared toward group discussion with the questions presented. What is good for the person using this book as an individual is the scripture reading. It differs from the average devotional which offers only 1 to 2 lines of scripture. “Live Second” will ask you to read larger portions of scripture… sometimes a chapter or more. It keeps the lesson for the day in a clearer context. What some people may not like are the video testimonies. While they are wonderful videos that share some amazing stories, some may find it a distraction to go online to watch them. If you have a QR reader on your phone (or another device) you can scan the code on the page and watch the video that way.